FEATURE: After reaching the EHF Cup Finals last season and losing in the semi-final to Füchse Berlin, Saint-Raphael Var Handball would like to go a little bit further in the EHF Cup this season. 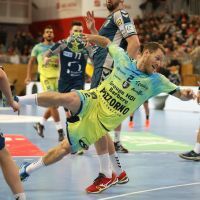 After reaching the EHF Cup Finals last season and losing in the semi-final to Füchse Berlin, Saint-Raphael Var Handball would like to go a little bit further in the EHF Cup this season. While they might have appeared as outsiders in a group where they meet with the German team again, they issued a bold statement last Wednesday by winning in Berlin against what appears to be their main rival for the first spot in the group. "I think we played very good in defence, we knew that our 1-5 defence would disturb them and it worked perfectly. For us, to start this group phase with a win was important, especially in Berlin. We want to go back to the EHF Cup Finals and we're proving it on the court" said Xavier Barachet after the game. The former Paris Saint-Germain right back has returned from injury this month, just in time for the start of serious matters in European competitions. Even though his team played well despite having to make do with only one recognised right back until then, such help will not do any harm. After suffering a wrist injury during preseason in the summer, Barachet is eager to return. "It feels good to be back on the court, the time away was too long. It was very frustrating for me, watching my team-mates play without being able to help them," he says. Despite competing with recent EHF EURO bronze medallist Adrien Dipanda in the same position as him, Barachet thinks there's room for both players: "At least having him by my side will give me time to reach my top level again. I won't have to rush. But there will be so many games before May that we'll both be able to show what we can do" he adds. At 29, Xavier Barachet was another addition to an already experienced Saint-Raphaël team, and alongside Daniel Sarmiento, one of the few that have ever been to Cologne for the VELUX EHF FINAL4. "He can help us on many sides of the game, he's a great defender, but he can also play on various positions in attack. He's calm and focused and someone who's been through a lot, handball-wise. I'm sure he wants to show he's able to play handball at a high-level again," says Saint-Raphaël coach, Joël Da Silva. And what better way to prove what you're capable of than to make it all the way to the EHF Cup Finals, and maybe win them.